It’s the pink elephant in your child’s room. I’m not talking about a stuffed animal but the often unruly beast known as the closet. For many, the kids’ closet has become the pinnacle of dysfunction — a wasteland of clothes, toys and odds and ends. With 2014 in its infancy, you can set the stage for it to be a new era of organization. Clothes can be hung neatly in place and a pair of shoes can actually be found together with a bit of time and a smart approach to organization. I know it sounds too good to be true. The idea of sorting through a sea of clothes and figuring out where to put it all is why so many of us often put it off for another day… or year. The key is to realize the amazing benefits you will reap from tackling this project. Your child’s organized closet will make a world of difference for you and your kids’ everyday life. Finding what you need with ease every time you go to the closet will lessen daily stress, frustration and save you time. There’s even a strong possibility you will save money. Knowing what your child already has in the closet will prevent you from buying duplicates. Perhaps most important of all is instilling good organizational habits your child can incorporate for a lifetime. So how are you going to really make it happen this time around? 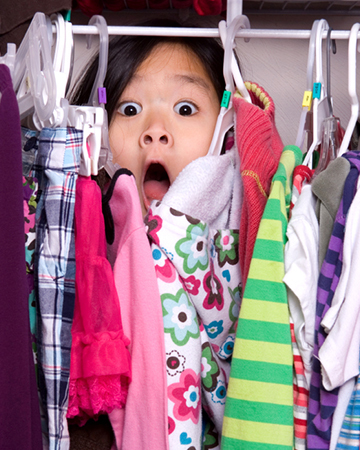 Follow these simple steps that will help you get your child’s closet in tip-top shape. 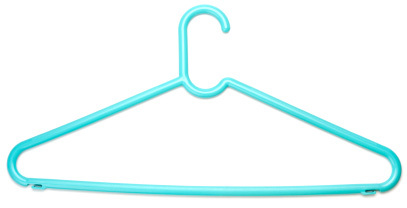 Chances are you’ll find many clothes hanging in the closet that no longer fit your child. Now there’s a real motivation to get rid of them thanks to Schoola Stitch. It’s a smart new program that offers the opportunity to donate gently-used kids’ clothes and raise money for your child’s school. Parents donate their child’s pre-loved clothing to their stylish online consignment store. Schoola Stitch sends you a prepaid shipping bag, then you fill it up and send it back to them. Shoppers then get great deals on brand name clothing (think 80 to 90 percent off retail) and up to 40 percent of the proceeds go right back to your child’s school. It’s a win-win-win. Here’s a simple approach to sorting through kids’ clothes — sort them into two piles. The first one is for clothes that are ripped or stained that can be discarded. The second pile is for clothes that are in good shape but too small that can be donated or handed down. You can zip through the closet in 10 minutes with this method. Added tip — if you live in a major city, you can hire a Task Rabbit or Gigwalk for $10 to $20 to make that run to Goodwill for you. Section your child’s closet by season. The result is it makes it a breeze for kids to find an outfit each morning based on the forecast. After the clothes are sectioned by season, you can further separate them by color and garment type to make them even easier to locate. Bins, buckets and similar containers give kids an easy way to store items like undergarments, socks, pajamas, accessories and shoes. It’s hard for kids to fold clothes neatly so giving them containers to throw them in to make organization easy and hassle free. Added tip — kids love labels. Having your kids pick out cute, fun tags or labels to place on the bins will give them a vested interest in keeping items in their rightful place. With space always at a premium, a great way to increase space for shorts and pants is putting in do-it-yourself drawer dividers. To store small items such as belts, small clothing accessories and extra buttons, try placing them in a silverware drawer organizer for safe keeping and easy access. What about miscellaneous little things your child collects — like rocks, seashells, stickers and vending machine prizes? A small bucket will do the trick to provide the catchall space needed for every kid’s small prized possessions. Stacey Boyd is a national parenting expert and founder of Savvy Source, a website she founded to help parents find the right preschool programs for their children. Once you’re finished, take a moment to savor the victory — but don’t let your organizational mojo die now. Keep it going by putting your newfound talent to work to shape up other closets in your soon-to-be-well-organized home.